Issuing a statement the LfD called for the President to reconsider the negative side effects on the rule of law and the Constitutional implications of deciding to grant said petition. The LfD also charged that media reports justifying the Thera’s release appear to be politically motivated. The group stressed his release will also have an adverse effect on the Ekeneligoda disappearance case and all other pending cases of political significance particularly those involving the military. Then what about Hon. Baududeen throwing stones to court. Impunity isn’t it? Ven Galgoda Atthe Gnanasara is the heart-beat of the Sinhala Buddhist Nation having lead the moral rejuvenation following the harrowing war waged by Tamils over 3 decades. Ven Galgoda Atthe Gnanasra’s incarceration is damaging the entire psyche of the majority Buddhist population. Thus his release is justified according to the the Highest Buddhist prelates. Any King who ignores the call for the release of Ven Galgoda Atthe Gnanasara will cause immense psychological terrorism on the Sinhala Buddhist population. Leave Bathiutheen alone; they (the minorities) are protected species. Anyone question Bathiutheen’s village reawakening in Wilpattuu? Don’t you dare; they are a protected species. 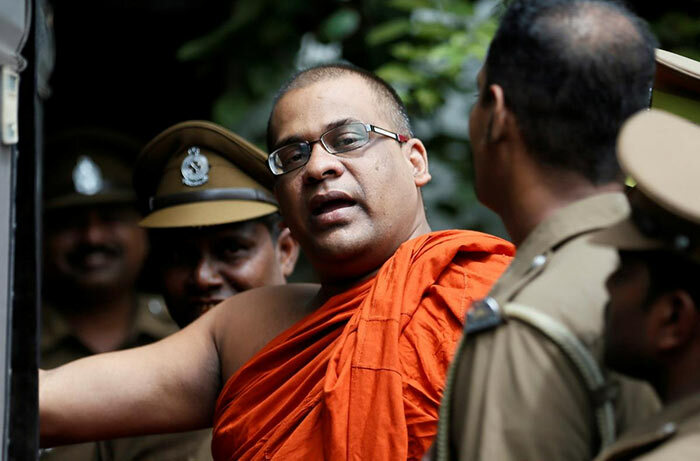 Bhikku Galagoda Gnanasara stands for sinhala buddhist solidarity something that the politicians essentially the bigoted lawyers brigade does not stand for. Undermining buddhist solidarity solidarity means that the country remains divided and as long as the country remains divided the politicians can manipulate the outcome of an election that has been happening since independence. Bhikku Galaboda Gnansara stood for what the political liberators failed to do dating back to post colonial period including the left wing with peoplelike Keuneman, NM Perera, Colvin of the past and contemporary left wing politicians like weerawansa, dissanayake who are suposed to stand for the `proletariat’ that does not exisit. The lawyaers have contributed nothing to national development. They do not have the inetllectually capability of rationalisng what national development is all about. They contend that the rule of is the solution to the national problems and feel the likes of Bhikku Galaboda Gnanasara is the problem. If these crooked lawyers feel that they can change the will of the people they are sadly mistaken. The people are waiting for the democratic process to take place and this hardline on the part of these crooked lawyers consider this strategy to be a means to an end then they are sadly mistaken. As is people are fortunate that they cannot afford lawyers as a result legal profession is bankrupt and they survive because of the judicial system where a lot of lawyers are paid by the goverment to defend the poor litigants. The prisons are as bad as the hospitals….overcrowded! What these stupid lawyers have to bear in mind is as to what happened in 1956 where the UNP faced a resounding defeat and that will be repeated in the coming elections. Ranil,s party has fallen on its face for want of credibility. Like the lawyers thaey do not have a political base. The program for the next election is in place at least the electorate knows as to whom they ought not to vote for. hardup lawers has not the resources to to run a campaigning other than to sustain the corrupt judicial system that has no leadership to speak of. The judiciary should be called on to clear the backlog of million prosecutions that are awaiting judgement without being preoccupied with petty crimes that ought not to have been broudght up by corrupt cops! The parliament should be called upon to deal with this crisis and the system be upgraded and manned by qualified people. I think whole country is becoming a BIG JOKE. There are many things which need to be looking into. We understood that there are few people who doesn’t like the country to be successful. Why they cant concentrate and clear CB Bond Scam, Sri Lankan airline issues, Vilpattu Issue, Sri Lankan High Comm related issues in many countries (ME, Italy, Malaysia, Etc), Political instability …. People also have minds, brains….they can see whats’ around. I object to one word in your blog. We are not becoming a JOKE; we are already the biggest JOKE in the whole wide world. We have a King who does not know his job; his Gazettes were rejected by the courts as ‘unconstitutional’. Yet, the taxpayers are paying this King to continue doing a stupid job. We have a minority Government which will not be able to get a Budget approved in Parliament. So, now they are planning to have a 2nd ‘National Government’. What a BIG JOKE we are !! All ready the whole country is a big joke, Actually it is a failed state. I have a suggestion. Now that the whole country is a ‘Big Joke’ and our 225 guys in Diyawanna is a big-Joke. Why not we all unite to release Bikhu Gnanasara and send him to Parliament. I am sure all these guys will hide under the bench! He will get the Sh.t out of them.